The ISPRS Geospatial Week 2017 (ISPRS GSW 2017, http://gsw2017.3snews.net) will be held in Wuhan, China, from September 18th – 22nd, 2017. This third ISPRS Geospatial Week will be organized by Wuhan University and will be the most important ISPRS event in the year 2017. The ISPRS GSW 2017 will be focused on the recent research developments and future trends related to geospatial information acquisition, extraction from point clouds, optical/SAR imagery, and ubiquitous sensors, Smart City and global changes, geospatial information mining, quality control and Geo-Big data processing, indoor 3D mapping and navigation, and UAV/UAS innovation applications. With a five-day colorful scientific program, people from geospatial academia and industry will be able to share research ideas, present latest research achievements, and discuss possible collaborations. It will be a very good opportunity for you to meet with top scientists, experts, researchers, and users in the field of Photogrammetry, Remote Sensing, and Spatial Information Sciences. A number of awards and competitions will also be organized during this ISPRS GSW 2017, including awards for best papers, and best posters, as well as benchmark competitions. Several technical/industrial exhibitions will be organized, which will present to you the advances of new geospatial technologies and solutions (e.g., Smart Cities, UAV/UAS). In addition, you will enjoy the splendid Chinese culture blended with modern technology through social events during the GSW 2017. On behalf of ISPRS council, I would like to invite you to join the ISPRS GSW 2017. You are warmly welcomed to Wuhan and China! The ISPRS Foundation (TIF), a non-profit entity established in 2003 and managed by a Board of Trustees responding to ISPRS grant needs that are identified by the ISPRS Council, offers Travel Grants to students and young professionals from developing countries to attend ISPRS-sponsored events such as the ISPRS Congress held 12-19 July 2016 in Prague, Czech Republic (http://www.isprs.org/foundation). 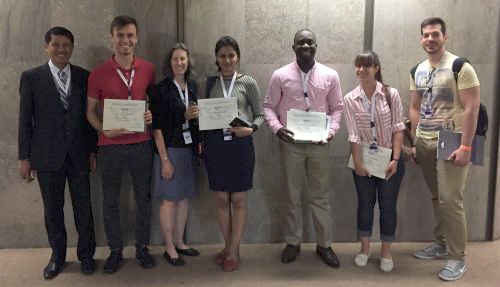 A total of 60 students and regional representatives largely from developing countries and demonstrating activity in the Congress by presenting research and/or participating in the General Assembly were selected to receive ISPRS/TIF Travel Grants financially supported by ISPRS, TIF donations and Congress waivers of registration fees. The recipients of these Travel Grants are requested to submit a report to the TIF Board of Directors summarizing their experience at the ISPRS event and featuring benefits they gained for furthering their research and/or professional careers. One such report, provided below, was submitted by Mr. Adedayo Kelvin Adeleke, Ph.D. Candidate in the Geomatics Division of University Cape Town, South Africa. He is shown in this group photograph of some ISPRS/TIF Travel Grant recipients at the Prague Congress this past July. Council is very pleased to announce that with the signing of a new MoU with the University of Stuttgart the next four years support for the ISPRS web site and the excellent work with our web master, Markus Englich, is secured. The director of the Institute for Photogrammetry, Uwe Soergel met with ISPRS president, Christian Heipke in December in Hannover where the document was signed. ISPRS is very grateful to the University of Stuttgart for the extremely generous continuing support which includes the complete infrastructure for the web site, along with the competent and efficient service provided by our web master. The International Society for Photogrammetry and Remote Sensing Book Series comprises significant scientific publications in photogrammetry and remote sensing, and related disciplines. Each volume in the series is prepared independently and focuses on a topical theme. Volumes are published on an occasional basis, according to the emergence of noteworthy scientific developments. The material included within each volume is peer-reviewed rigorously, ensuring strong scientific standards. Note: Discounts on books apply to ISPRS members. To facilitate on-line and off-line learning and knowledge sharing, a website, named “Remote Sensing E-community for Digital imaGe procESsing (RS-EDGES)”, has been created for sharing computer codes, algorithms, systems, products, and publications that support remote sensing observations and applications, digital image processing, and the extraction of geophysical and biophysical information. Through co-learning, sharing, and collaborating, a virtual community is hoped to be built among researchers, practitioners, teachers, and students. Initially, RS-EDGES focuses on the time dimension of remote sensing optical imagery. Technical sponsorship is sought among pertinent professional societies, which are asked to make an announcement in their websites, email lists, and newsletters. Individuals are invited to endorse the project by offering their computer codes, algorithms, products (datasets, models, platforms, systems) and publications, and to become the project partners. It is expected that by sharing of codes, algorithms, products and publications, researchers will disseminate their results more efficiently and learners can save much precious time to avoid re-inventing the existing techniques and models. Furthermore, the collaboration and cooperation among researchers with similar interests can foster future inventions and discoveries. MIGRATE – MIGRation pATterns in Europe \[see 1, below\] is a Web mapping gaming application aimed at educating and raising awareness about the phenomenon of migration in Europe. MIGRATE has been developed by a team of researchers from Politecnico di Milano (Martina Aiello, Maria Brovelli, Candan Eylul Kilsedar, Marco Gianinetto, Marco Minghini and Mayra Zurbaran Nucci) \[see 2, below\] within the third call of MYGEOSS project \[3\], which has received funding from the European Union's Horizon 2020 research and innovation programme. This challenge allows you to win prizes while becoming informed about the hot topic of migration in Europe. Joining the challenge is very easy: you just need to create an account and play the game as much and as best as you can! At the end of the challenge, the top 10 players in the user ranking will be awarded with Amazon vouchers. See \[4\] for the details about the prizes and the rules used to compute users' scores. The application makes full use of open data \[5\], is fully developed using open source software and is released as open source (code available at \[6\]) under the EU Public License (EUPL). Based on its research theme, the ISPRS WG on Environment and Health (ICWG III/IVc) has arranged publishing a special issue. When you click on “Submit Online” on the journal’s website as an author, you will be taken to the Editorial Manager page for Login information. https://www.editorialmanager.com/emas/default.aspx. After creating your account and beginning the submission process, you will be asked to choose an article type. You need to select “SI: Geospatial Technologies in Environmental Health Applications” from the drop down menu. The International Conference on Urban Geoinformatics (ICUG) will be organized at TERI University, New Delhi, and partnered by the Indian Society of Remote Sensing (ISRS) and the Indian Geographical Society (IGS). Challenges of rapid urbanization, ranging from governance, infrastructure and environment, can be effectively solved by integrating many varied multi-disciplinary fields – including Geoinformatics. Integration of spatial information with spatial data relating to complex problems in urban sciences and urban engineering is rapidly gaining acceptance as a means of making future cities 'smart' as well as sustainable. With rapid urbanization poised to take off in India, the need for harnessing all means – including geoinformatics – towards growth of well-planned, smart and sustainable cities needs no emphasis. India is also being looked at by its neighbors to take a leadership role in the region so as to effectively partner with neighboring countries for sustained regional growth. International collaboration is therefore also one of the aims of the conference. The 2nd International Workshop “Photogrammetric and computer vision techniques for video surveillance, biometrics and biomedicine” is intended to offer presentations and discussions of novel achievements in photogrammetric researches for surveillance and medicine. The deadline for full papers is Jan. 31, 2017 and for abstracts, Feb. 28, 2017. More information is available at https://www.ipi.uni-hannover.de/hrigi17.html. For further information see here …. Lena Halounová attended the meeting as ISPRS representative. Read her report here…. Einari Kilpelä passed away on December 1, at age of 79 years, after a long illness. Prof. Kilpelä was chair of the Photogrammetric Institute of the Helsinki University of Technology from 1976-1993 and served ISPRS in many functions. He was President of Commission III for two successive periods (1980-88) and Chair of the Financial Commission. He also designed two prestigious ISPRS awards, the Helava medal and the medal for the Doyle Award. A detailed obituary will be published in the next eBulletin. A Special Issue on "Smart Solutions for Disaster Risk Reduction: Big Data Concepts for Disaster Risk Reduction (DRR)" is to be published and the call for papers is out. This Special Issue aims to promote innovative concepts, methods and tools that help in solving current and future problems in DRR, assisted by space and (geo)spatial technologies, approaches in GI Science, and mapping. The deadline for manuscript submissions is 31 January, 2017. Belgium through the Lens of Rail Travel Requests: Does Geography Still Matter? International Workshop on "Photogrammetric and computer vision techniques for video surveillance, biometrics and biomedicine"